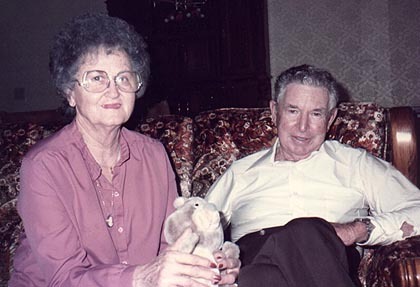 My parents, Jay and Vera Griffin, were married for nearly sixty-one years. Mother was a homemaker and an artist. Daddy was a farmer. They were devoted to one another and each depended on the other for everything. Our dad farmed until he was 80 years old, and then he just quit nearly all physical activity. He was getting rather feeble by the time he became ill in early 1994. He read the Bible every day and would write the date in the back of his New Testament every time he completed reading it again. They both loved the Lord and Daddy spoke often about going to Heaven. He passed away on February 14, and Mother died on March 4, eighteen days later. Click to view the lyrics for this song,"
You're At Peace in His Love"